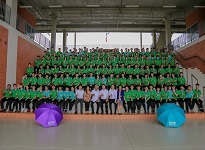 06 February 2019 Executives, teachers and students from Banmuangpitthayakhom, Sakon Nakon , Wednesday, February 6, 2019. 11 January 2018 Another first at KVIS! Kamnoetvidya Science Academy (KVIS) is pleased to announce that the College Board has welcomed us as an official SAT Test Centre (71146) in Thailand, making us the first Thai school that has been given this honor. 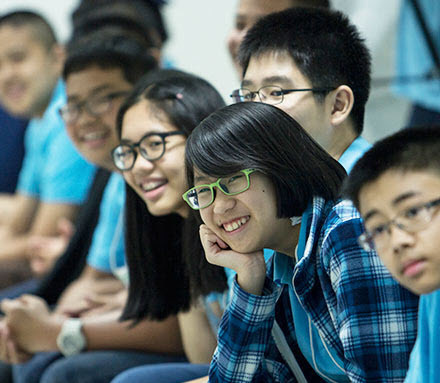 We are now the first Thai school to be able to administer both the AP and SAT tests! Lyceum Physical Technical High School Affiliated with the Russian Academy of Science is a secondary school founded in 1987. 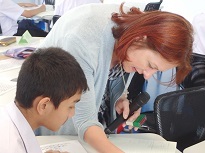 The school is situated in Moscow and accept students who are talented in science and mathematics. Apart from the academic activities, the GSHS exchange team got exposure to learn more about Thai culture by attending special classes held by KVIS teachers, including Thai language, Muay Thai, and art classes. They also enjoyed spending their “homestay weekend” with their KVIS buddies' families, exploring and visiting various attractions in Bangkok and other parts of Thailand. 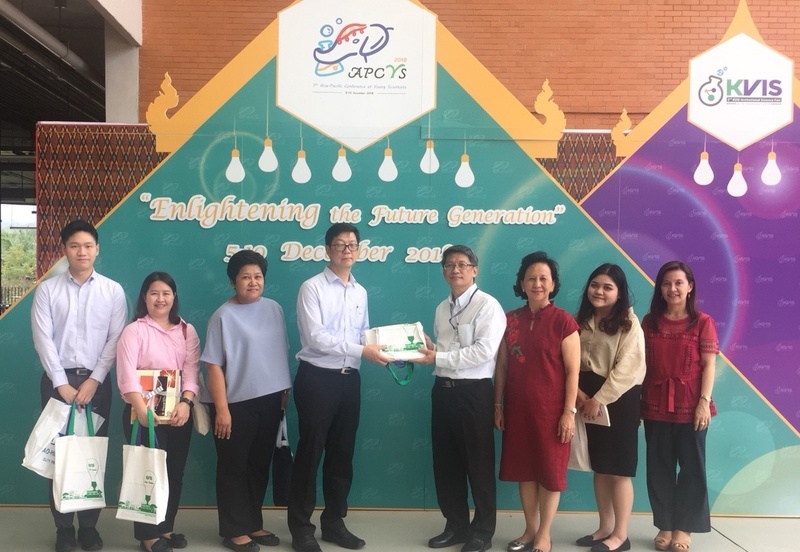 Dr. Park and the team were given warm welcom by the principal Dr. Thongchai Chewprecha, administrators, teachers and staff members. They had a campus tour of KVIS classrooms, laboratories and other facilities. Following the tour, GSHS delegates also visited VISTEC and PTT Wangchan Forest Project. On 25th October, KVIS students and teachers had an opportunity to listen to Dr. Park’s special lecture under the topic of “Gifted Students of The Future”, held at KVIS auditorium. 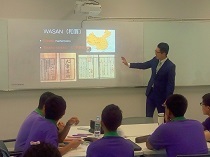 The highly informative presentation about the Japanese math from Edo Period, 16th to 18th century, not only gave an excellent overview of the Japanese mathematics from that period but included a lot of illustrations and practical puzzles from original historical sources for our students to try. One special puzzle of Wasan style was contemporary, created by his student, Hayakawa Saya, especially for KVIS students. During their visit to KVIS, the delegates got an opportunity to observe classes for English and Chinese language teaching. They conducted students development activities to guide KVIS students on Emotional Quotient (EQ). They emphasized that, ‘As educators, we must not only provide our younger generation with a rigorous academic curriculum, we also have to develop their EQ to create an awareness in realistic life'. 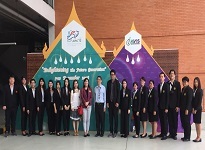 Dr. Thongchai Chewprecha, Director of KVIS took the delegates for a campus tour in KVIS and Vidyasirimedhi Institute of Science and Technology (VISTEC). Dr. Hayyong was impressed with the STEM research being carried out in KVIS and VISTEC. 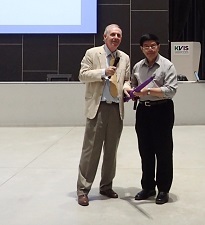 Prof. Suresh, visited KVIS following his visit to Chulalongkorn University, Bangkok. He gave a special lecture on the application of mathematics in modern scientific advancements. His lecture was attended by KVIS students and teachers from the Department of Mathematics and Computer Science. During his talk, Prof. Suresh motivated the students with the possibilities of utilizing mathematics for higher studies and research. The ISSF is an international venue for high school students to present research projects. Eventually, KVIS has been granted the opportunity to host the 16th ISSF in 2020. A week later, KVIS welcomed Mr. Ian Kenworthy, the principal of Camborne Science and International Academy, and Mr. Bob Adamson, the STEM Program Director of Fort Richmond Collegiate, Canada . During the 2-week visit, the team experienced variety of activities. They joined the classes in Mathematics, English, and Psychology with their KVIS buddies. The students also got exposure to conduct the experiment led by KVIS' senior advisor. A session was initiated between the exchange and KVIS students in order to share their research interests. Apart from the academic activities, the team experienced Thai boxing, learning to wear Thai traditional costume, and Thai classical dance. 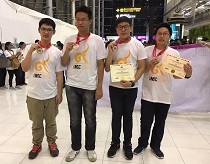 M5 students Jirayus Jinapong and Ananyoch Ardnaronglid participated in this competition and represented in the contingent of Thailand along with competitors of countries like Singapore, Phillipines, Indonesia, India, Iran, China, Hong Kong, South Korea, Australia and Malaysia. He had an interction with KVIS students. The students entertained him by playing traditional thai music and he enjoyed the time with our students. Later he was presented with a painting done by M5 student Ms. Nalina Raweewonganothai. QASMT provides International Baccalaureate (IB) programme. IB has high levels of strength in the concepts included in the programme. Moreover, QASMT is a multicultural environment with a combination of students and well experienced teachers from different countries and cultures. 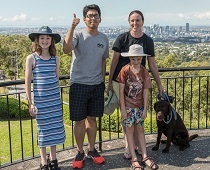 Mr. Guntaphon went with 3 students to Academic College Group, Auckland, while Ms. Thanaporn and Mr. Warin along with 6 students went to University of Otago Language Centre (UOCL), Dunedin. The latter is seen as a continuing collaboration between KVIS and UOCL. Mr. Surayouth, with his project named “Study of Iron Nanoparticles-embedded Carbon Particle Fabricated by Solution Plasma in Waste Vegetable Oil on PEMF and Sustainable Energy”, was awarded with silver medal. KVIS students displayed a scintilating performance in Thai dancing. The students also sang songs as a symbol of paying respect to their teachers. For the first time in KVIS, this ceremony was done with all 3 cohorts. KVIS participated in the science fair and presented few of the remarkable projects of the students. Students from all over the world participated in the science fair. Amidst high level of competition, KVIS students won "Most Innovative Research" and "Excellence in Poster Presentation" awards. KVIS team did their best and bagged bronze medal. 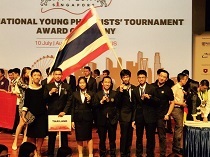 It is the first time in the history of Thailand that its contingent winning a medal in this prestigeous competition. This proud moment will remain lush green in the pasture of KVIS memories. 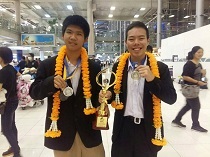 Mr. Pollakrit won bronze medal in the individual competition and Mr. Chawapat won Honorable Mention and Excellence in puzzle soving awards. Both of them won silver medal in team based competition. The team had an opportunity to explore KVIS curriculum by observing classes with their buddies from KVIS grade 12. They also got exposed to extracurricular activities like Thai Language, Costume and Thai Boxing (Muaythai). The projects presented by KVIS students were highly appreciated by the jury. These projects were advised by Mr. Theparak V Palma as supervisor and Dr. Thanit Pewnim as Co supervisor. Dr. Thongchai Chewprecha, Director of KVIS gave a talk for inspiring the prospective students with PTT's objective on KVIS. After this talk, he answered for most of the queries asked by students and their parents. The exchange programs were a grand success as the students gained better understanding in science and mathematics education and Thai culture. Most importantly, both the students and teachers form GTC and GSHS had developed friendship with KVIS students and teachers, which will continue for years to come. Thanakrit's second archive of birds visiting KVIS. A clear evidence of improvement in KVIS' ecosystem. The ceremony at KVIS was observed in KVIS in the morning between 09:30 and 10:30 hrs with a sacred chant. KVIS was visited for possible collaborations by delegates from Philippines and Netherlands during January and February, 2017. On 2 February 2017, an MoU between OL and KVIS had been signed by the principals of both schools. 22 September 2016 Mr. Yojiro Miyashita (โยจิโระ มิยาชิตะ, JICA representative), and Dr. Takahiro Otsuka (ทากาฮิโระ โอซึกะ, JICA representative) to visit Kamnoetvidya Science Academy to get to know the set up and the running of the school. 31 July 2016 Associate Professor Sergey Varlamov from Kolmogorov School of Moscow State University was a visiting teacher at KVIS from 1-31 July 2016. 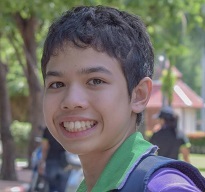 Thanakrit Wongsatit, KVIS Cohort 2 Student, has been collecting data on "Birds at KVIS" since May 2016. Some of them are shared with all of us here. 02 November 2016 KVIS and Bunkyo Gakuin University Girls’ Junior and Senior High School (BGUH), Tokyo, Japan, signed a memorandum of understanding on sharing a goal to mutually develop creativity and the talents of the gifted students. 25 November 2016 Delegates from Meijo University Senior High School visited KVIS to discuss possible collaborations. 28 November 2016 Ambassador Sadoshima attended a presentation on KVIS and VISTEC given by Dr. Pailin Chuchottaworn, Chairman of Power of Learning and Power of Innovation Foundation and the school governing board. 20 December 2016 Chadin Kulsing (P’Din) and Yada Nolvachai (P’Da) are both graduates from Monash University, Australia with Doctorates in Chemical Analysis. They both held Faculty of Science Dean's Scholarships which paid tuition fees and personal expenses. They are teaching at the University and continue to work on chemistry projects. 23 December 2016 Mr. Yoshio Okamoto will be joining KVIS "Earth Science Team" at the beginning of the new academic year in 2017 to co-teach Earth Science at KVIS with the KVIS Chemistry and the Geography faculty. 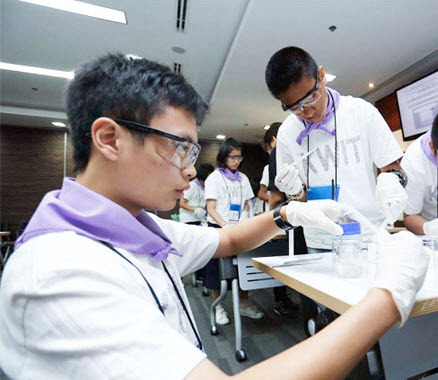 It is expected that KVIS students will work with Teacher Yoshio Okamoto to set a "KVIS Seismograph System" that can monitor even subtle movements of the earth crust in the ASEAN region. 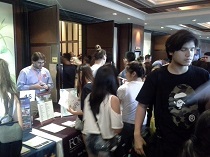 Ms. Lai also introduced the availability of scholarships for Thai students with the government of Taiwan. Taiwan government scholarships is offered during January - March every year. If the scholarship application gets approved then the prospective student may receive a sum of 15,000 NTD per month. After the lecture, she visited the labs of VISTEC and then to the exhibition which portrayed achievements of KVIS and VISTEC. KVIS got student publications in internationally eminent journals.